While essential oils are really good for skin. It’s not meant to be used directly on skin. 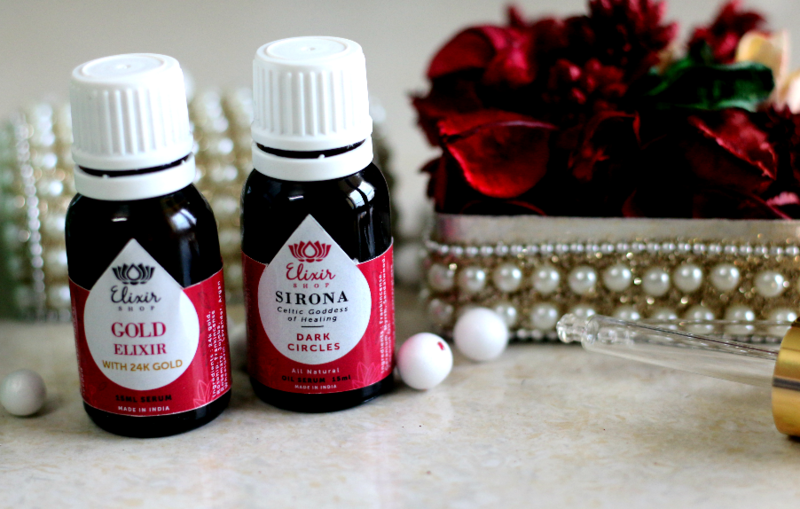 I love aroma therapy oils and I have been mixing and matching various oils with the carrier oil – almond or coconut since so many years now. Essential oils penetrate through the outer layers of the skin, and heal from within. Essential oils, Though they are proven to be wonderful on skin. if not used correctly, you’d end up with rashes and burns. One must not apply undiluted oils directly to skin. They are very concentrated and may cause chemical burns, rashes and allergies if used undiluted. 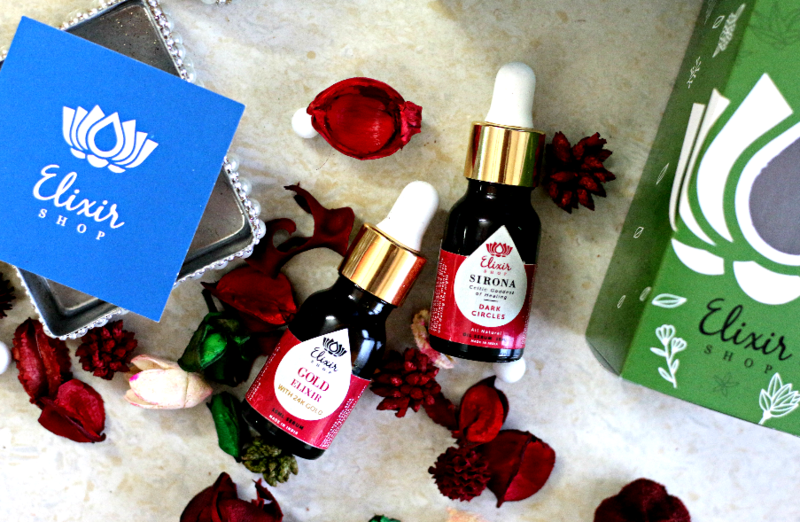 I recently discovered this wonderful skincare brand that specially make oil blends to address various skin concerns. I was gifted two of their best sellers to try. If you are into 100 % natural, chemical and preservative free, oil based products. 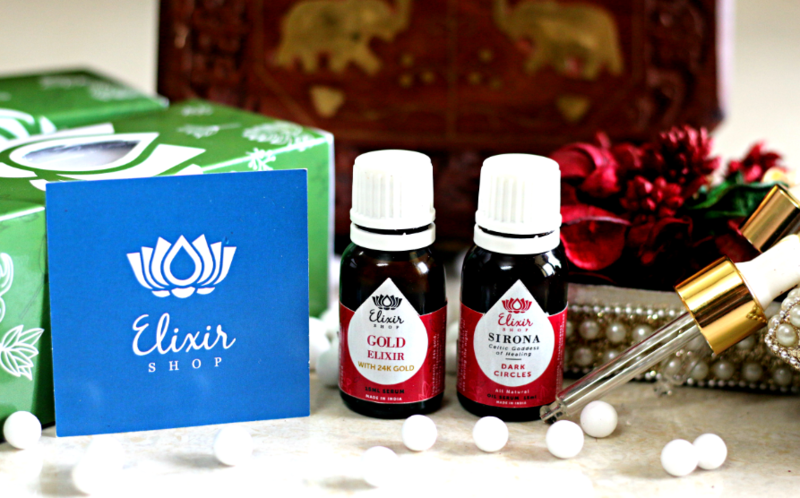 Shop Elixir is perfect for you. They have a variety of products to repair your skin, hair, or body. 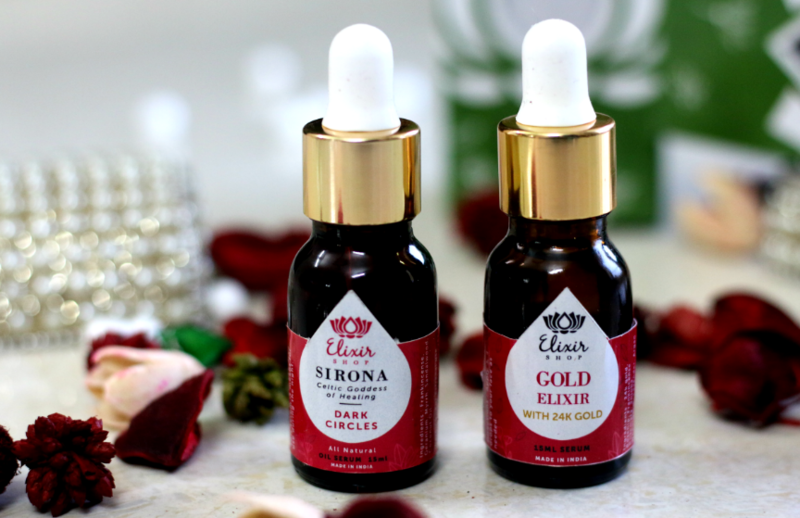 Elixir Shop has a range of skincare oils/elixirs that are a unique blend of essential oils, which go deep into the cells molecular structure to repair it from within. The packaging is very simple. Basically a dark glass bottle with a dropper. I love the lotus logo of the brand. The ingredients are listed on the label. I like the face that dropper was kept separately. Initially, when I got them. I was very surprised to see a dark circle elixir. I have never used any 100 % natural oil blends specifically for under eyes other than Kumkumadi Thailam. 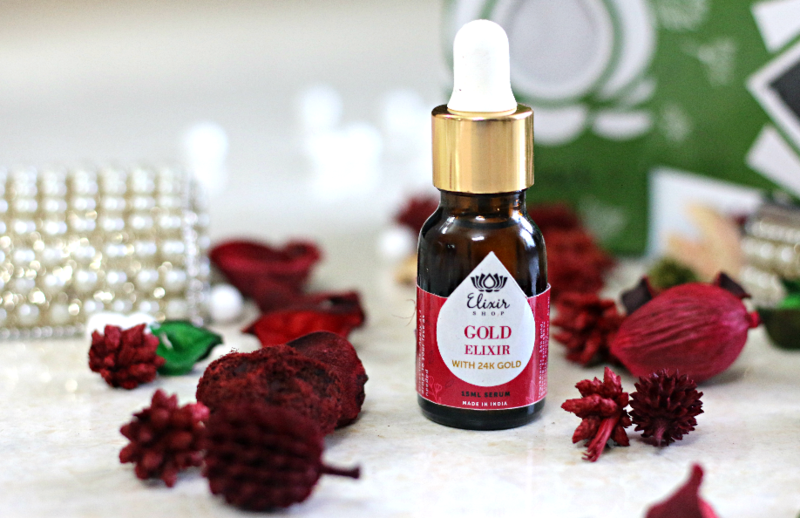 I love the skin loving ingredients in this 24 K gold elixir. 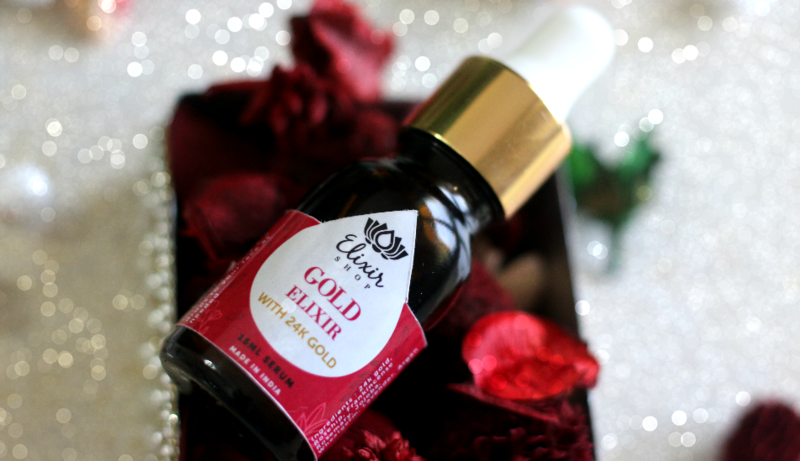 With all the hero ingredients that are awesome for nourishment and rejuvenation of skin, This 24 K gold elixir is a perfect lightweight moisturizer that helps give your skin an even skin tone and slows the aging process. If used regularly, It minimizes the acne marks and blemishes on your skin. As it gets absorbed almost instantly, You can use it right after your cleansing and toning. You may mix 1-2 drops of this to your regular moisturiser and use if you have dry skin. Another amazing fact about it is it’s divine smell. The fresh floral fragrance is very soothing and it instantly uplifts the mood. Dropper makes it convenient to take the right amount. 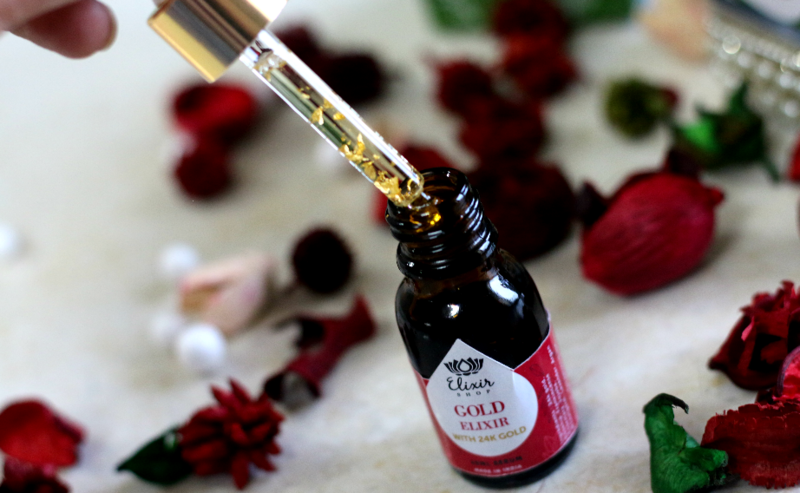 Upon contact with skin, The pure 24k gold absorbs by vanishing into the skin leaving a natural glow. Now, the moment you apply it – You might feel a tingling sensation and it’s absolutely normal. It fades off after 3-4 seconds. 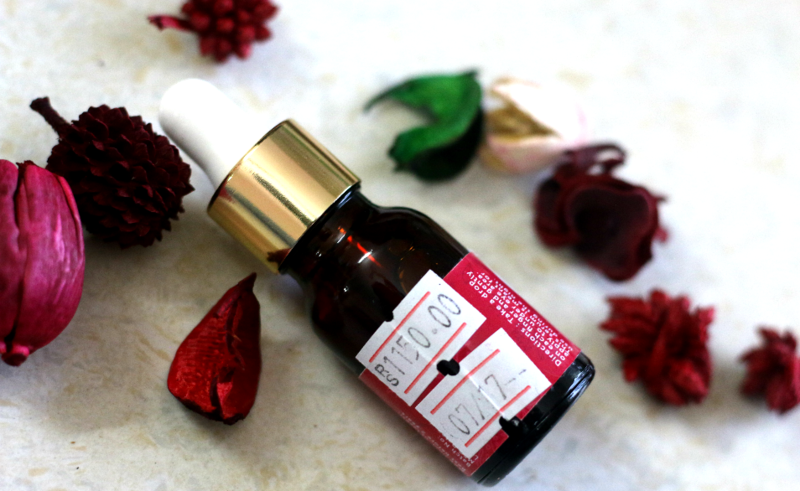 The serum is enriched with the best skincare oils like Lavender and Rosehip, the serum is rich in vitamin A, C, and Vitamin E that have anti-aging properties along with essential fatty acids that keeps your skin moisturized and healthy. This serum can be used during day or night. There are multiple ways by which you can use this product. After applying this if you try to blend the foundation. Foundation goes very smooth. And, it doesn’t cling to dry patches etc. Skin remains nourished and best part is it don’t clog your pores and cause acne like other facial oils. The best way is to wash and tone your face, and then apply 4-5 drops of the serum all over your face and neck. You can then proceed to apply any other product or make up. 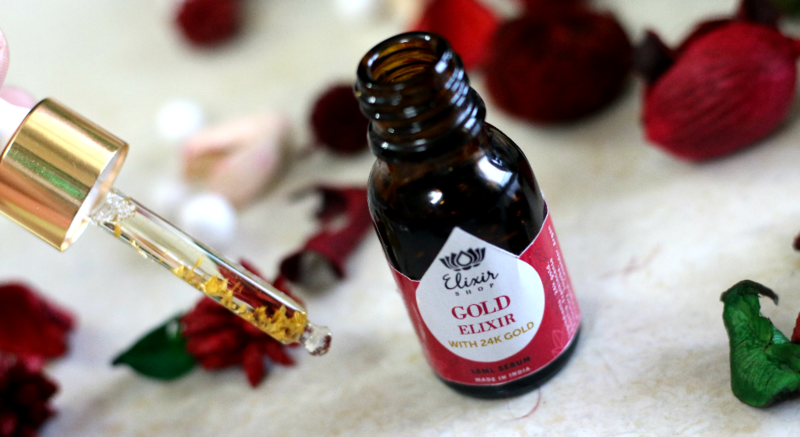 You can apply a few drops to feel instantly refreshed through the day, even on top of your make up (use only 2-3 drops so as to not smudge your make up). You can apply a drop to your lips to moisturize and lighten your lips over time. You can use 1-2 drops under your eyes to refresh and lighten them over time. One important thing to keep in mind is that – not every natural product might suit everyone. So, always do a patch test to see if the ingredients are suitable for you. 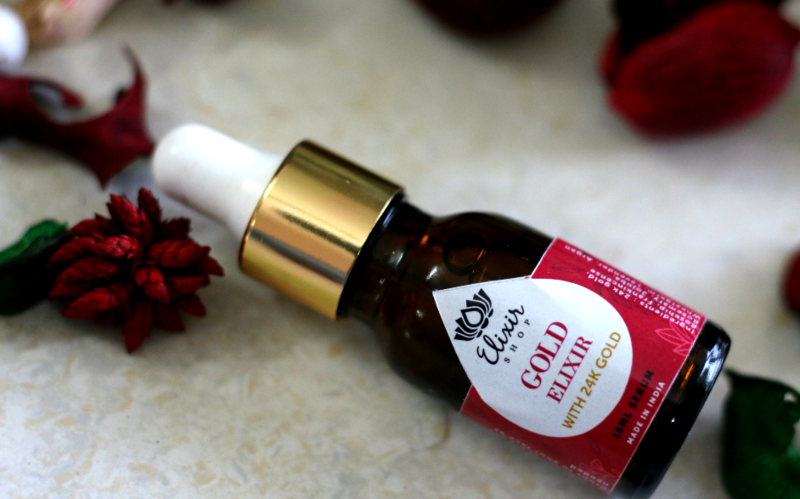 This 24 K gold elixir is suitable for dry, oily, or a combination skin type. 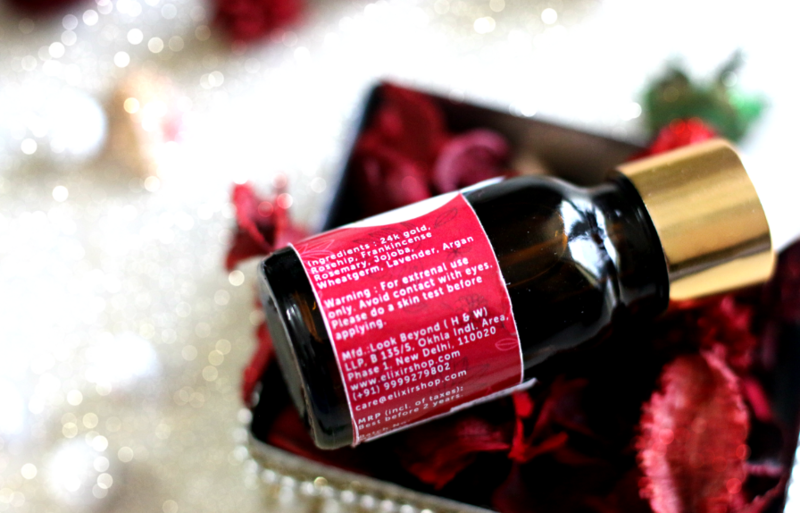 The serum only has oils that are quick to absorb and are non-greasy. Avoid using the serum too close to the eyes. If it get anywhere near the eyes. It stings badly. I like to massage few drops on to my skin at night. I get a relaxed sleep and it helps me unwind all stress. me and my mom love it. The smell is really relaxing and if you are someone who suffers from migraine. You’d definitely check these out. These oils are best for you. After a tired day at work. Before you hit the bed you can apply few drops on your face avoiding the eye area and massage it nicely on your cleansed skin. I love the fact that it’s light weight, non-greasy and nourishing. I am using this every night before my moisturiser. I have about quarter left. I am definitely repurchasing this. 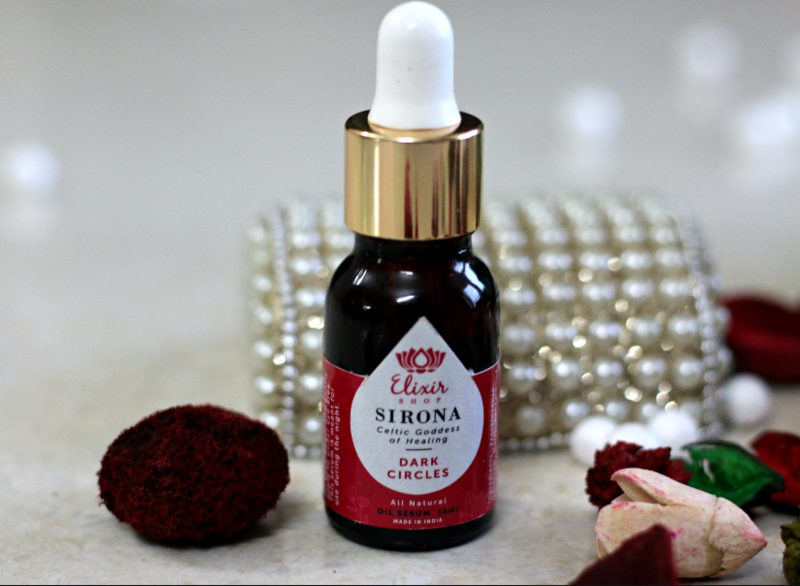 Sirona is a under eye serum that claims to reduce dark circles naturally. 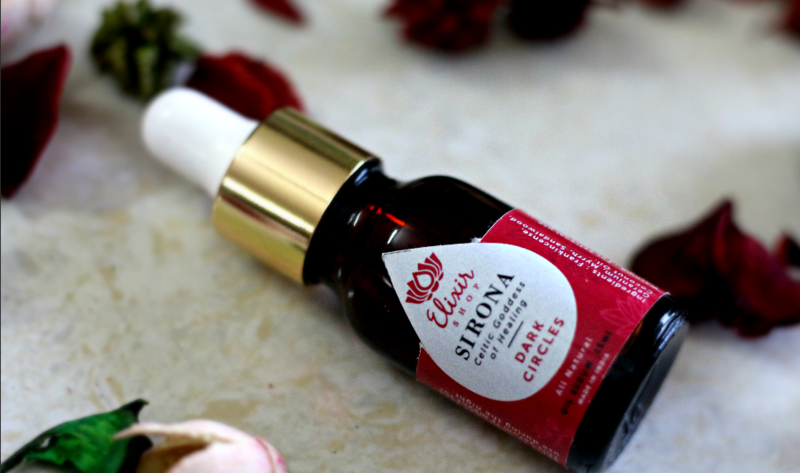 It’s enriched with Sandalwood oil, famous for its skin regenerative ability, Formulated without any chemicals or preservatives, it uses the richness of essential oils to increase skins ability to heal itself, bringing about a natural radiance. This under eye serum is meant to be used at night only. Whatever skin type you have- oily, dry, or combination ; the effect of Sirona will still remain the same. It’s not greasy at all. Sirona does leave a tingling sensation on your skin after you apply it, which is normal. Start by removing your makeup. Follow your regular Cleansing , toning routine. 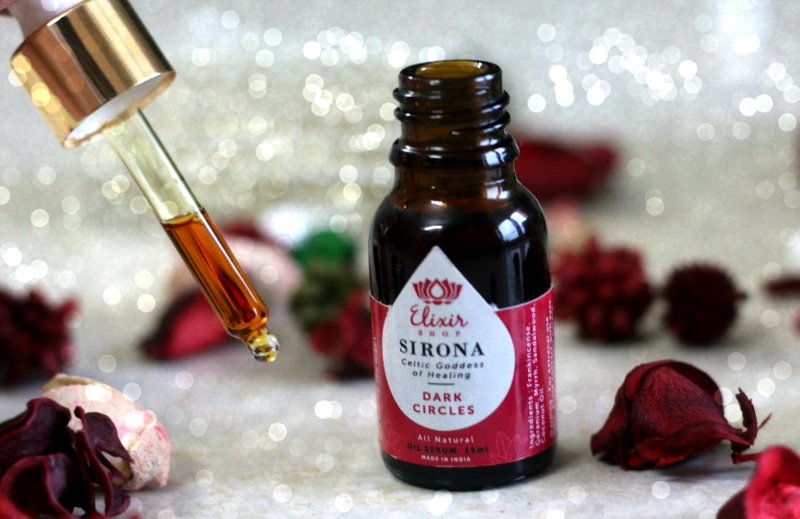 After patting your face dry, take a drop of Sirona on each finger and apply it to your undereye area, avoiding the eyes. You can keep your eyes closed to avoid the area safely. 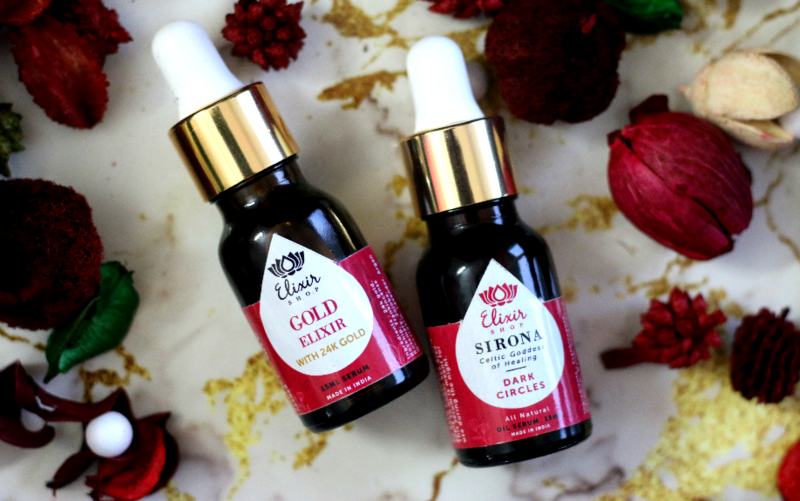 Wait for 1 minute while the serum absorbs before using any other product or Elixir Shop serum. Certain essential oils are “phototoxic”. That means they make your skin more sensitive to the ultraviolet light. Strange, but true! So, avoid sun exposure for 12 hours after applying any of the following oils to your skin. Apply a sunscreen of spf 50 and higher before leaving the house. 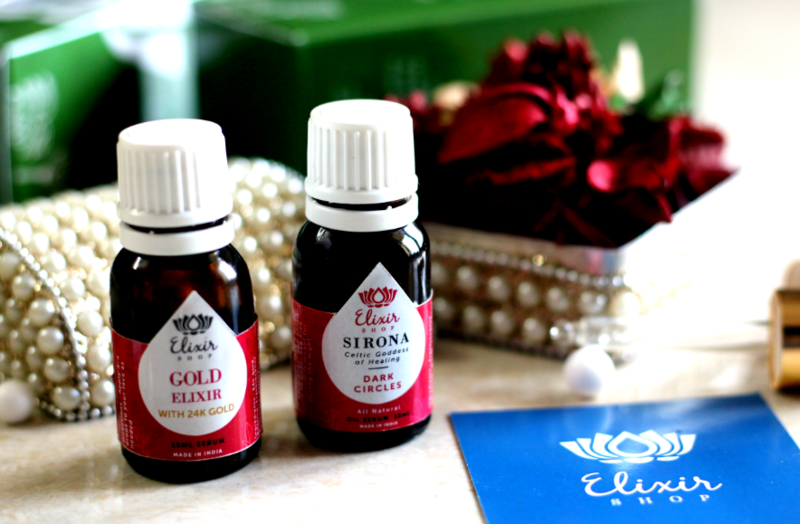 Sirona Elixir by @elixirshop has Sandalwood oil, which is famous for its skin regenerative ability. It smells so divine. If you have dry under eye area. You can mix a drop of this to your eye cream and apply it underneath your eyes. Initially, when you apply you might feel a tingling sensation. But, it’s absolutely normal and fades away in few minutes. I love to use this at night on alternate days. As these are natural products – They have a 2-year shelf life from manufacturing date. Please keep the products away from direct sunlight to ensure longevity and efficacy. As a wise customer, understand the difference between fragrance oils and how some skincare blends smells nice but, no quality or any results. The reason is simple. The ingredients it’s made out of is not pure. There are many ways to get essential oils but the most common and effective one is through steam distillation. 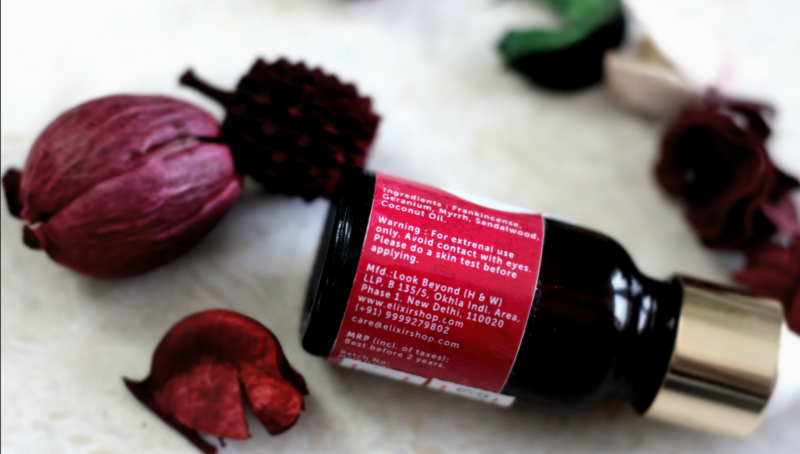 It takes a large amount of the plant to produce even 1ml of oil, which is why it is very concentrated in nature! But, it is the same strength that gives essential oils the ability to heal and repair without the need to add preservatives, chemicals, or any artificial product. 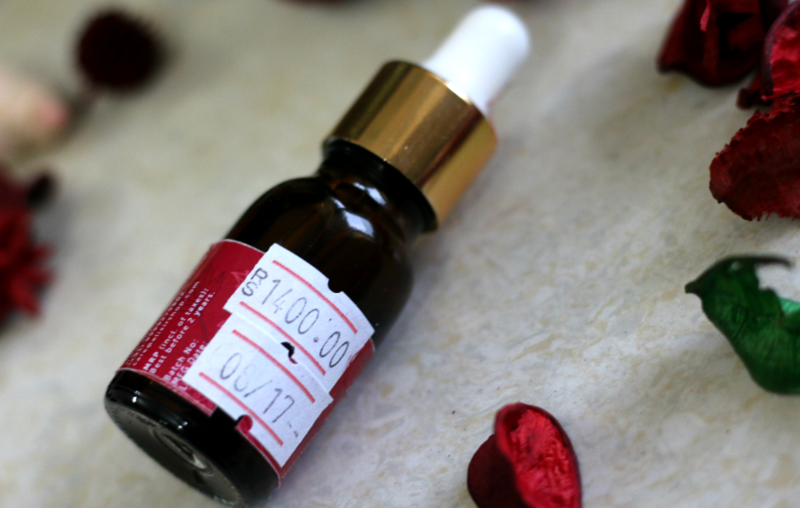 You don’t have to search for the Aromatherapy recipes for skin care. Or be an expert to make awesome blends! Elixir Shop is here to rescue. 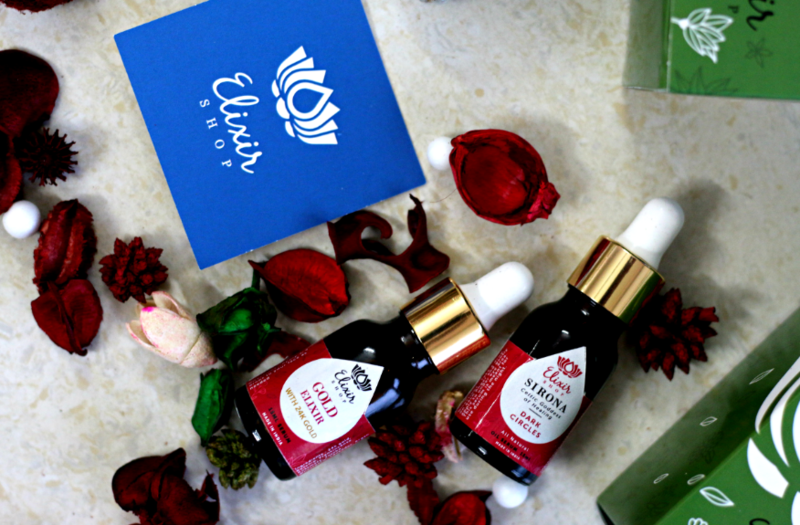 Elixir Shop’s ingredients are 100% pure essential oils and is perfectly hand blended to their natural blends which is tailored to be used for the various skin and hair concerns. ** Products send by brand PR. However my opinion is unbiased and true to my readers. Anything with 24k gold is right up my alley. Thanks for sharing detailed review. So helpful! 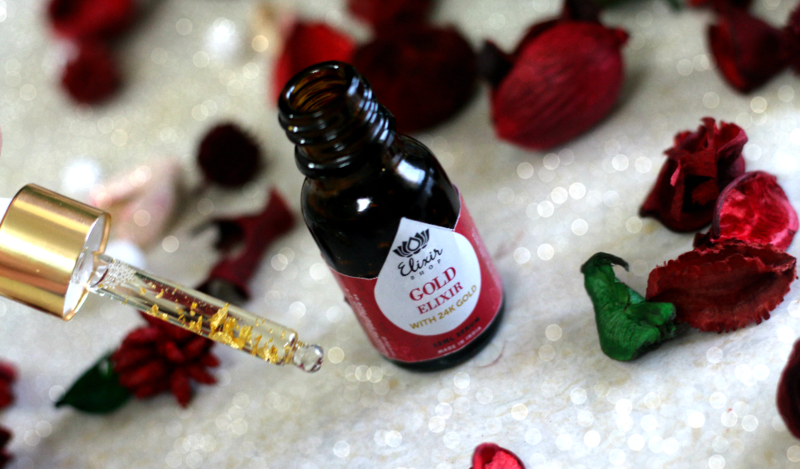 Love this detailed post, 100 percent natural and 24k gold…I am sold. 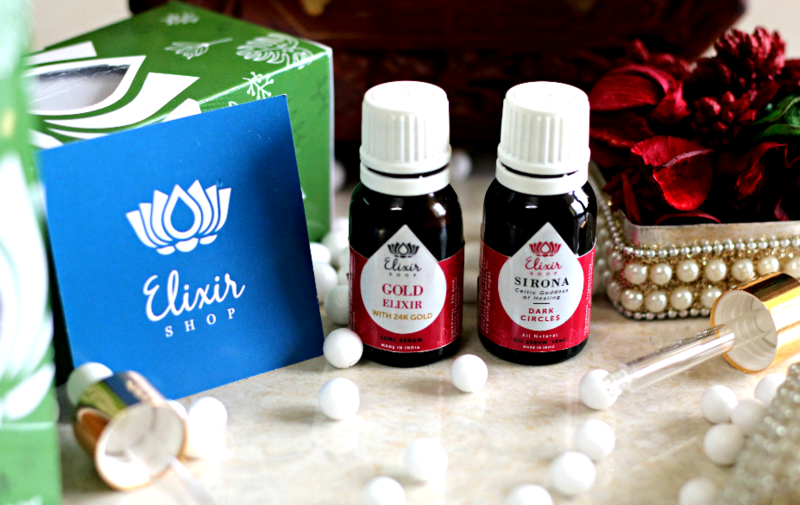 The blends sound amazing, I am very much into essential oils, will check these out. Is this also available in EU? That’s what blog are for….Hope I can introduce lot of awesome brands to you! Wow.. These seem amazing and looks so luxurious.. I am looking for something for my dark circles Would love to give this a try..
Learnt something new today , thanks for sharing ! The pictures are breathtaking. The serum looks very promising. 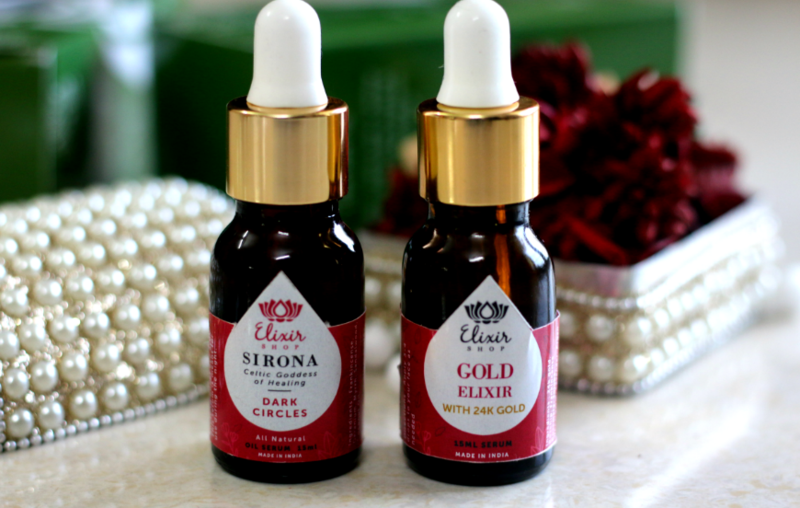 I Love Elixir product. They are super nice and makes the skin very good. Such a nice detailed review. Its really helpful. Love how detailed this post is!! This oils look amazing! !